A ferocious Tyrannosaurus Rex bares its jagged teeth on the poster. There's a quote describing it as "awe-inspiring". Perhaps that's why some hapless parent plumped to bring a gaggle of excited five year olds to Dinosaur 13. Unfortunately for her and the children, this is less a thrilling romp through the Mesozoic period and more a dry, analytical documentary about a complex legal battle, with a focus on the minutia of South Dakota land law. Enjoyment of Dinosaur 13 hinges on two things. 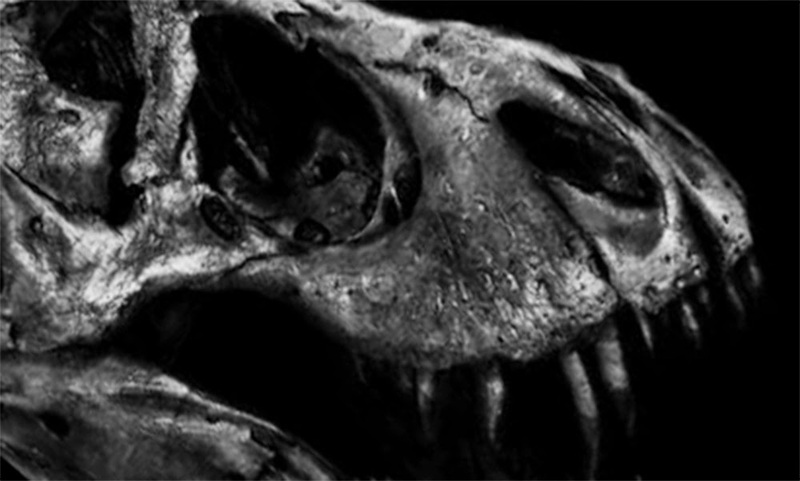 If you're interested in the commercial processes behind paleontology you're onto a winner. Similarly so if you like picking through legal logic puzzles. Fortunately I like both, so Dinosaur 13, though a pretty damn dry documentary, held my interest for the full two hours. The five-year olds lasted an hour, with one increasingly dismayed kid politely whispering "Mummy, when are the dinosaurs coming?" The titular Dinosaur 13 is the most famous dinosaur fossil in the world; Sue. 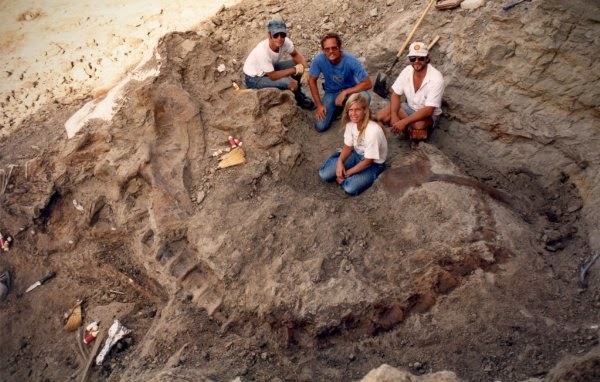 Discovered in the badlands of South Dakota in 1990 Sue is the thirteenth T.rex discovered, and the largest, most articulated and best preserved. A discovery like Sue is every paleontologist's fantasy and through grainy early 90s camcorder we track the excitement, amazement and sheer awe on the faces of those gently excavating her from the desert. 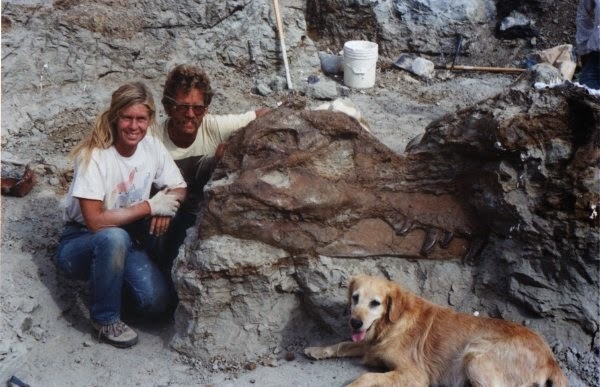 Peter Larson, Sue Hendrikson and Sue (and a dog). Their leader is Peter Larson, fossil-mad since a child and infatuated with his discovery. He and his brother Neal co-founded the Black Hills Institute in 1974, a commercial paleontological company set up to unearth fossils and sell them to museums around the world. He speaks in movingly poetic terms about the thrill of his work, explaining that the light from the stars in the sky left their stars at the same time as the fossilised animal breathed its last, sandwiching him within hundreds of millions of years of history. With Sue safely out of the ground and the landowner compensated the future was bright. Local spirits were high: children would regularly come to visit Sue and plans were afoot to raise money to construct a local museum to house her - a huge economic boost for this small town. Then, one day the FBI and the National Guard showed up, ordered everyone out of the offices, packed Sue into crates and bundled her into a dimly lit warehouse - her home for the the next four years. The bulk of the film is devoted to the resulting legal battles between the US Government, Maurice Williams (the owner of the land Sue was found on) and the employees of the Black Hills Institute. Douglas is clearly on the side of Black Hills and the film treats the battle as an inherent perversion of the legal process; a tale replete with vindictive judges, hints of shadowy conspiracies and the overpowering bureaucracy of the US Government. The mantra repeated throughout the film, whether it be in stock footage or talking heads, is "This the land of the free! How can this happen in America!?" This unified chorus against the depredations of 'big government' exposes the libertarianism embedded deep in Dinosaur 13, something best highlighted when the film uses a clip of Bill O'Reilly to support their case. Boiled to its core, Miller argues for the freedom of private enterprise; that a citizen should own the fruits of their labour and be able to dictate its commercial use. Short shrift is given to the US Government's position that Sue, having been discovered on land held in trust for the Sioux tribe, legally belongs to them. There's a fascinating ruling midway through proceedings that dinosaur fossils are land. The paleontologists are unified in their indignance that Sue be regarded as "real estate". Ridiculous as that might seem it's a smart bit of legal reasoning: given that the original dinosaur bone has become mineralised over millions of years it is literally composed of 'land'. The crux of this is that in buying Sue, the Black Hill Institute was unknowingly negotiating for the purchase of land from Maurice Williams, land which he was legally unable to sell. Dinosaur 13 never admits for a moment that its scrappy underdogs could be anything other than in the right - when the law defeats them they fall back on a position of moral superiority. Fortunately for Miller they can claim this ground much more successfully, with a subsequent criminal trial appearing to move into the realms of the genuinely vindictive. It's a testament to the skills of Miller that, even though I'm opposed to the libertarian philosophy upon which Dinosaur 13 makes its case, I find it easy to sympathise with the people caught up in it. Peter Larson's devotion to Sue is hugely touching; their separation more reminiscent of a tragic love story than scientific endeavour. This passion gives the final shots of him striding purposefully back into the endless desert a great deal of gravitas. On display to the public in Chicago. But the heart of Dinosaur 13 is Sue. She is heart-wrenchingly beautiful, her enormous bones infused with regal dignity and a subtle sense of loss. When she's ultimately sold to the Field Museum in Chicago for a massive $8.4 million the paleontologists aren't surprised, saying "she's worth so much more". Sue is one of the most magnificent things ever drawn out from beneath the earth, beyond all the politics and law one thing is crystal clear: she was worth fighting for.